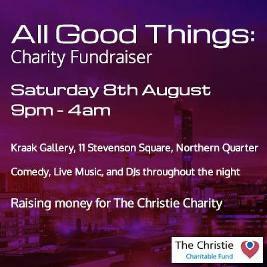 The All Good Things crew invite you to Kraak for a fun filled night of comedy, live music, and DJ’s to take you through the night. With some of the funniest and most talented up and coming comedians, musicians, DJ’s and Producers performing on the night this is a night not to be missed. DJ’s bringing you a range of music from Reggae, Ska, Funk, House, UK Garage and Drum n Bass to keep you dancing till the early hours of the morning: Lend Me Your Ears, Senor Prezidente, Mike Boote, Dee-p and Yas. With live music from Old House Playgrounds’s Tryfo Lazos. Opening the night are two of the funniest guys Manchester has to offer, Eji Osigweand David Stanier. All profits form will be given as a charitable donation to The Christie Charity.